This is the best all around mini-trampoline designed specifically for children. The Seaside Adventure Bouncer with flexible enclosure ensures that the little ones don’t slip or bounce off the side of the trampoline. This mini-trampoline was specifically designed without springs to prevent any potential pinching of tiny fingers. Rather, the Seaside Adventure Bouncer utilizes stretch bands as a safer alternative to traditional springs. The mini-trampoline also comes equipped with a handrail built into the flexible netting to help children stand and develop their motor skills. Mini-trampolines are an excellent way to provide a secure physical activity environment for your child. A safe trampoline alternative for your little ones on the go. 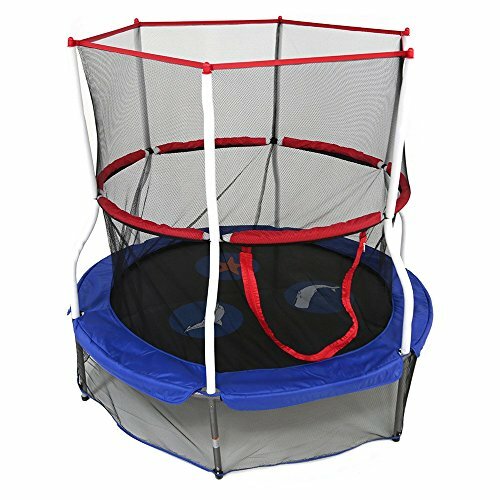 This is the perfect fit for toddlers that are too small for the 8ft trampoline, but yet still want to experience the joys of jumping; and of course the benefits of trampoline exercises. Some have experienced difficulties in assembly. Please see the reviews below to navigate any potential issues. Foam handrail can tear if put under stress. Q: Is this trampoline big enough to fit 2 children? Q:How easy is it to detach the poles in the event trampoline needs to be moved? A: Quite easy, detach the net, and remove the poles. Very straightforward. Q: How sturdy is the wrap-around handrail? A: Although not recommended, there have been 2-3 kids on it at once, therefore must be fairly sturdy!